I wrote a book - The Social Skills Guidebook: Manage Shyness, Improve Your Conversations, and Make Friends, Without Giving Up Who You Are. It contains SucceedSocially.com's most important concepts for improving your social life in a tight, organized, professionally-presented package. 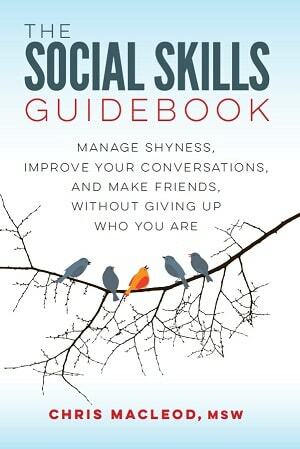 I can confidently say it's one of the most detailed, comprehensive guides to core social skills out there. It's available as a paperback, ebook, or audiobook. It's reasonably priced too, in the same range as your typical professionally-prepared book. The book covers the same ground as the site. It's a guide for people who feel they need to brush up on their interpersonal skills. Also like the site, the book is aimed at adults and older teenagers. The paperback is 362 pages long. The audiobook is 9 hours and 23 minutes. The first section covers how to feel more confident, and less shy, anxious, and insecure around people. It offers hands-on strategies for reducing feelings of nervousness, recognizing and dealing with counterproductive thinking patterns, gradually overcoming your social fears by facing them, and raising your overall self-esteem. The second section will hone your conversation skills. Its first few chapters cover some overall strategies for making conversation. Then it will tell you how to navigate various stages and types of conversations. The next block of chapters go over some core skills that will make your interactions go more smoothly, such as listening and non-verbal communication. The section closes out by covering some broader personality traits that will make your time with people more enjoyable. The third and final section is about how to meet people and make friends. It goes into detail on developing the right mentality for forming a social life, places to meet people, how to invite potential friends out, how to deepen your relationships, how to make a group of friends, and how to troubleshoot issues with all of the above. A theme running throughout the book is that you don't have to change yourself into a completely different person to have more satisfying relationships. People who consider themselves shy, awkward, or lonely sometimes worry that they'll need to sell out and give up their personality and hobbies in order to fit in. Nothing could be further from the truth. The concepts the book teaches are general tools that anyone can use to form the kind of social life that works for them. If you'd like even more info, you can visit the book's page on Amazon to take a look at the Table of Contents and download the written sample of the first few chapters (I'd recommend the downloaded sample over the Look Inside feature, which is known for not doing justice to books' actual Kindle formatting). The audiobook sample covers a different stretch, from the first chapter in the section on making friends. "Wait, so you said the book is a well-put-together, cohesive summary of ideas that are already in the site?" Yep. Like I said, the book covers the site's key concepts in a refined, organized package. That's hardly to say the core articles have just been lazily cut & pasted into a document. The information's been edited, rearranged, and tightened up so it's concise and fits together. The interior text has been professionally laid out so it looks nice too. The audio's read by a professional narrator. That said, there's some material in the book that I haven't gotten to on the site, but for the most part if you don't feel like buying a copy, you can browse through the site's free articles and piece together the same information. Compared to the book it will be a more disjointed, less-convenient experience, but I realize some people have no problem choosing that over making a purchase. 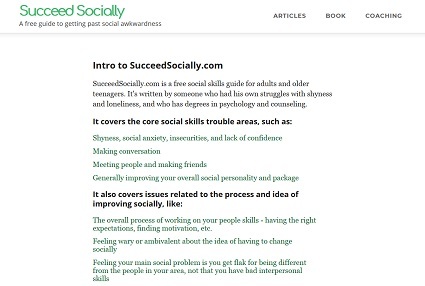 SucceedSocially.com never set out to be one of those sites with a bunch of short, half-useful teaser articles that all try to get you to buy a pricey book or audio course which promises to contain the "real" helpful advice. I wrote a book simply because over the years many people asked for one. If you like what I have to say about social skills, you've got more options about how to take in what I write. If you're happy to absorb in the site's information by pouring over a sprawling collection of free articles, that's great. If you'd rather be given the refined highlights in a single package, which you can hold in your hands, listen to on a walk, or gift to someone, you've got that choice too. No pressure. The Amazon links should direct you to the appropriate Amazon store for your country. However, if you get sent to the wrong location, go to the one you want to use, search for "The Social Skills Guidebook", and it should come up. Dislosure: The links are Amazon affiliate links - yep, I can be an affiliate on my own book - so if you buy The Social Skills Guidebook, or other Amazon products, through it I'll earn a bit extra. If you don't want to buy through an affiliate link, you can easily head to Amazon and look up the title.